Travelogue of An Armchair Traveller: Where old planes go to die! 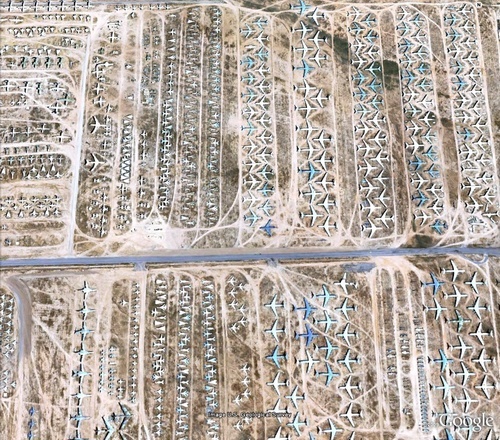 Such places are commonly referred as - Boneyard, because once a plane arrives there, it will usually not leave intact, but will be cannibalized for parts until nothing but scrap metal remains. There many such places around the World specially in South-West USA, where particular kind of climate and the chemical characteristics of the soil helps to preserve the aircrafts. Shown above is a part of the biggest Boneyard of all - Aerospace Maintenance and Regeneration Group (AMARG), a USAF aircraft storage and maintenance facility in Tucson, Arizona, located at Davis-Monthan Air Force Base. It takes care of more than 4,400 aircraft. The planes are generally sealed and can be harvested for parts or reactivated as needed. As per BBC News "Spread across the huge 2,600 acre site, equivalent in size to 1,430 football pitches, is a collection of over 4,000 retired aircraft including nearly every plane the US armed forces have flown since World War II. Now, for the first time, a series of high resolution satellite images of the four square mile-site have been released by Google Earth. They show in incredible detail the full range of aircraft found at the site."